... is the motto for the World CML Day campaign! Today, together we can make World CML Day more visible and engaging! Together we can make it global! If you are not sure how to use all these tools you can watch the training - video at http://www.cmladvocates.net/cmlhorizons/cmlhorizons2016 (Advocacy session #4). This video contains valuable strategic information and suggestions for how to get the most out of the campaign, how to do your own campaign and learn from best practices. We wish you all an inspiring and successful World CML Day 2016! PS: Please do not forget to be creative and share the photos and activities of your World CML day with us by e-mailing to ! Report of CML Horizons 2016 in Slovenia is now available, plus all presentations and web streams! 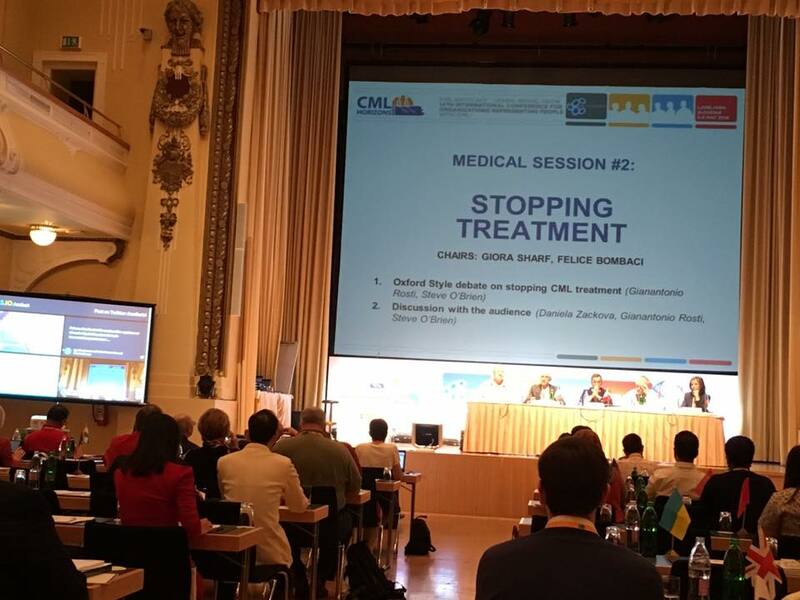 From 6-8 May 2016, the CML Advocates Network welcomed 118 CML patient advocacy leaders from 65 countries at its global annual international conference "CML Horizons" in Ljubljana (Slovenia). Key CML experts reported about newest data on CML research, treatment and care. Leading patient advocates shared patient advocacy initiatives and best practice in areas like patient-generated evidence, fundraising, campaigning, access, generics, financial management, involvement in research and partnering with medical writers. We have now compiled a detailed report which summarizes all presentations and discussions at CML Horizons 2016. Download the CML Horizons 2016 conference report here. In addition, all presentations and video recordings of all sessions at CML Horizons are also available here. Market exclusivity for imatinib has lapsed in 10 EU countries, most countries to follow in 2016. CML patients have been increasingly exposed to generics and copy drugs in the treatment of CML, raising concerns about outcomes when patients are switched between products for non-medical reasons. A survey of patient organisations and physicians by the CML Advocates Network in 2013 determined that generic imatinib and dasatinib were available in 32 countries. 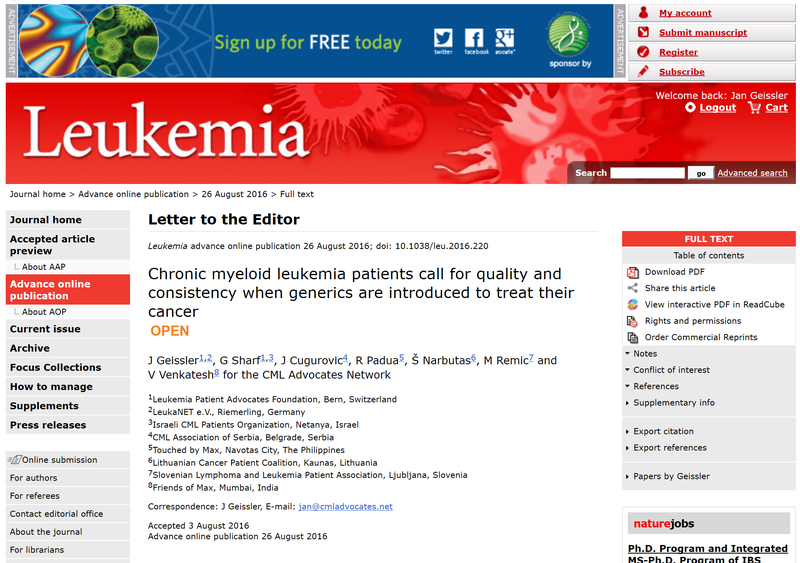 In 2014, CML patient organizations released a declaration, calling for quality and consistency when TKI generics are prescribed, demanding data on bioequivalence and clinical equivalence to the originator drug. Patients should not be switched between products with the same substance for non-medical reasons. If a switch is enforced, it should not happen more than once a year, with sufficient follow-up assessing safety and efficacy. In case of loss of response or increase in toxicity after switching, switching to the previous treatment or another treatment should be allowed. More frequent molecular monitoring post-switch should allow early detection of differences in effectiveness or toxicity. 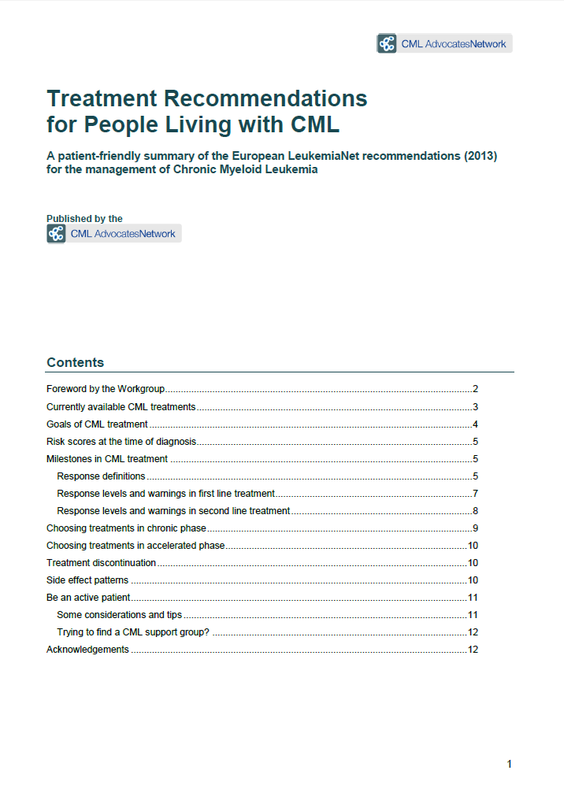 These recommendations by the patient community may support experts' discussion on CML management with TKI generics. The 21st European Hematology Association’s Congress (EHA, 9-12 June 2016) was abuzz with networking between over 10.000 participants who travelled from all over the world to Copenhagen. The EHA Congress combined sessions and a diverse range of topics around Hematology highlighting state-of-the-art clinical practice, recent advances, new data and views from different stakeholders and international organizations. A hot topic this year were the European Reference Networks (ERNs). The CML Advocates Network is actively engaged in the upcoming ERN on rare hematological diseases. In the CML Education Session at the EHA congress, Dr Mustjoki from the University of Finland was presenting about immunological predictors of successful treatment discontinuation in CML. 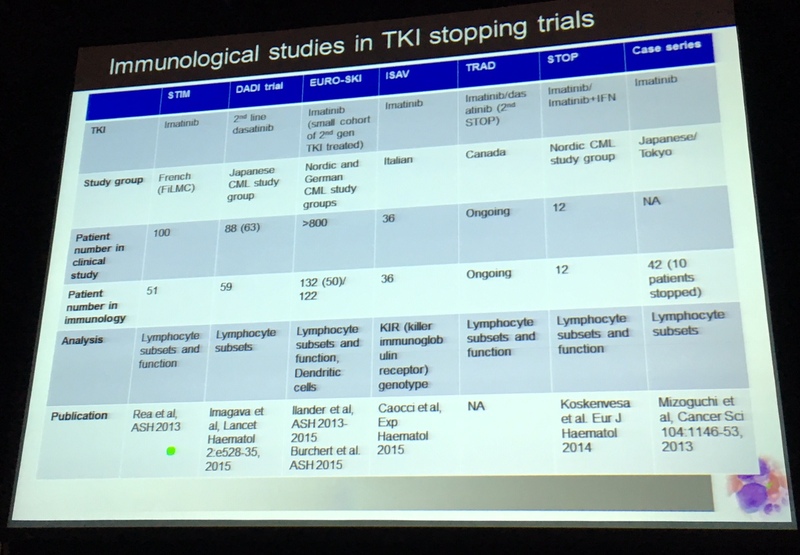 Lessons learned from treatment discontinuation studies are that nearly half of patients who have achieved deep molecular response at least for two years are able to discontinue TKI therapy. After discontinuation, residual CML on a very low, fluctuating PCR level has been detected in many patients. Similar issues have been observed with Interferon treatment in the 1990s where most patients had molecular evidence of residual disease despite successful discontinuation. Patients who had achieved good response on Interferon and have been able to stop therapy had increased levels of “natural killer immune cells” (NK-cells), lower levels of specific T-cells or a unique cytokine profile compared to those patients who failed stopping treatment. The immune mechanisms were also observed e.g. in the single-center study in Mannheim from 2001 where patients received imatinib and Peg-Interferon combination therapy and then subsequently stopped imatinib or both drugs. Brian Huntly from the Cambridge Institute for medical Research, UK, was presenting about research in CML blast crisis in the CML Education Session at the EHA congress. CML in blast crisis still has a grim outlook. Life expectancy is still poor with 7-11 months, and transplant is required for long-term survival. About 10% of CML patients are still diagnosed in advanced or blast phase, and around 5-10% progress within first 10 years of Imatinib therapy due to persistence and resistance of CML stem cells, so in total around 20% of CML patients are somehow affected by blast crisis. The biology of CML progression is still poorly understood. BCR-ABL itself seems to be genotoxic and is providing the environment for mutations. Mutational studies are still rare, many conducted with old-fashioned sequencing technologies on a small number of patients, rarely studies with genome sequencing. Collaborating mutations as highly heterogeneous. Potential drugs that ar currently in use are Sorafenib (RAF inhibitor in use in renal and hepatic cancer), PD0325901 (MEK inhibitor in use in lung cancer), GSK343-EZH2, I-BET (Myc inhibitor in use in AML, Myeloma) and Ruxolitinib (JAK1/2 inhibitor). Therefore, potential molecular targets for blast crisis are MYC, EZH2/PRC2, RAS-RAF-MEK-ERK, JAK-STAT which are being investigated. In summary, CML progression is a rare but still catastrophic disorder which is poorly understood and very difficult to treat. Mouse models are in use to better understand the human disease and the mutational spectrum, and can inform both on biological mechanisms and development of therapies. Some drugs on the aforementioned targets are in early phase clinical testing. However, outlook is still poor so it is of key importance to prevent progression of CML into advanced phases. Francois-Xavier Mahon was presenting about the current state of play in stopping CML treatment at the EHA Satellite Symposium on CML, hosted by Novartis. Here is a brief summary of Jan attending the session just now. In terms of what we know about stopping Imatinib, Francois-Xavier Mahon presented the data of the first STIM (STop IMatinib) in France, where about 38% were able to successfully stop treatment without having detectable disease with a median follow-up of 65 months. Similar rates were observed in other STIM studies like STIM2 (50% still undetectable at 24 months), TWISTER (47% still undetectable at 24 months), A-STIM (61% without loss of MMR at 36 months), KID (59% without loss of MMR at 24 months), STOP2G-TKI (57% without loss of MMR at 24 months) and DADI (Dasatinib, 48% without PCR rise above 0,0069%), ENESTop (58% without loss of MMR) and EUROSKI (51% without molecular relapse at 24 months). So depending on therapy re-initiation criteria, across studies there seems to be roughly a 50:50 chance that stopping treatment in deep molecular response is successful. We hereby proudly welcome a new member organisation in the CML Advocates Network: MOHA based in Budapest / Hungary is our second Hungarian patient organization. The CML Advocates Network now counts a total of 109 member organisations in 82 countries worldwide! See the list of CML groups in the Network on our world map. Please sign this petition run by the Indian patient organisation "Friends of Max", calling on the Indian government to reconsider their government decision of raising significant import taxes on free Glivec donated to Indian CML patients through a patient assistance programme. For the past 13 years, Glivec was provided for free as a donation to CML patients, but now the Indian government may raise import taxes on a hypothetical financial value of the donated Glivec. This threatens the continuation of the free donation of the drug to thousands of CML patients in India. Please sign the petition at Change.com. We hereby proudly welcome two new member organisations in the CML Advocates Network: 1. "MIELOPRO" - Asociatia Pacientilor cu Neoplazii Mieloproliferative based in Romania and 2. CML-Armenia based in Armenia. The CML Advocates Network now counts a total of 108 member organisations in 82 countries worldwide! See the list of CML groups in the Network on our world map. It is now available in 20 languages: English, Arabic, Albanian, Azerbaijani, Bulgarian, Chinese (traditional and simplified), Croatian, Danish, Dutch, French, Georgian, German, Hebrew, Italian, Polish, Portuguese, Russian, Serbian, Spanish and Turkish (new: Croatian, a big thank you to Dražen Vincek (president of CML Club in Croatian Leukaemia and Lymphoma Society (HULL)) and his colleagues for translating, reviewing and approving this new version of the lay-friendly summary! Free EHA congress registrations for representatives of hematology patient organizations: Deadline 3 May 2016! This year's EHA Congress will be held 9-12 June 2016 in Copenhagen, DK. Thanks to very patient-centric thinking, EHA continues to work closely with the patient community and is again offering a “Patient Advocacy Track” within the scientific program. As in previous years, EHA is again providing 50 free congress registrations for leaders of hematology patient organizations to give patient advocates the opportunity to attend the EHA congress in Copenhagen. The free registrations are only available to representatives of patient organizations, and EHA is requiring them to attend our capacity building session (planned for Saturday afternoon). The registration allows access to the scientific congress, but will not cover travel or accommodation costs. If you are interested in a free registration, please state your interest in a free registration here. Deadline for free registrations is 3 May 2016! There will be no extension of the deadline and no late registrations. EHA, MDS Alliance and CML Advocates Network will do their best to allocate the 50 free registrations fairly amongst organisations and advocates. Please note that registrations are to be confirmed by the EHA office -- the MDS Alliance and CML Advocates Network just collect statements of interest on behalf of the patient community. We will let applicants know as soon as possible. For more information on the 21th EHA congress, see here.